A journalist’s provocative and spellbinding account of her eighteen months spent disguised as a man. 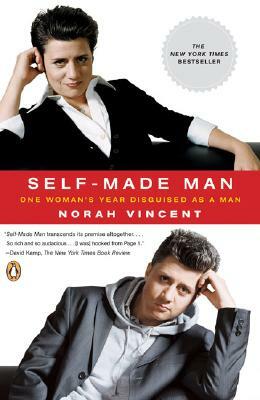 Norah Vincent became an instant media sensation with the publication of Self-Made Man, her take on just how hard it is to be a man, even in a man’s world. Following in the tradition of John Howard Griffin (Black Like Me), Vincent spent a year and a half disguised as her male alter ego, Ned, exploring what men are like when women aren’t around. As Ned, she joined a bowling team, took a high-octane sales job, went on dates with women (and men), visited strip clubs, and even managed to infiltrate a monastery and a men’s therapy group. At once thought-provoking and pure fun to read, Self-Made Man is a sympathetic and thrilling tour de force of immersion journalism. Norah Vincent is the author of the New York Times bestseller Self-Made Man. Previously, she wrote a nationally syndicated op-ed column for the Los Angeles Times. Her work has also appeared in The New York Times, The New Republic, The Village Voice, and The Washington Post. She lives in New York City.